On Friday, December 12, Sister Karen Klimczak’s legacy Christmas Prison Package Project will continue at Blessed Trinity when dozens of volunteers gather in the church to assemble more than 2000 gift bags for men and women in the Wende and Albion correctional facilities. Anyone interested in assisting can join one of two shifts: 10 a.m. to 1 p.m. or 6 p.m. until completion (usually about 9 p.m.). Just bring your willing hands and hearts to our church at 317 Leroy Avenue, Buffalo, NY 14214. Sister Karen originated the project years ago so that incarcerated men would know they were not forgotten. The project has since been expanded to include women inmates. Thousands of pre-packaged food items as well as paperback books will be collected from area congregations, community members and businesses, but they need to be packed into hand-decorated bags and readied for delivery. 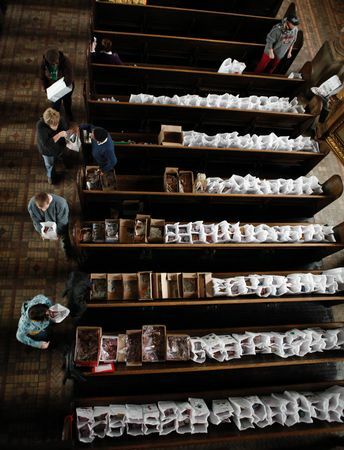 Blessed Trinity’s parishioners are contributing boxes of hot cocoa packets, with a goal of 4000+ individual servings. Click HERE to see ways in which you can help, and read about The Cocoa Challenge.